Sir Alfred Munnings was a British Impressionist painter and President of the Royal Academy. A member of the Newlyn School, he is best known as a sporting artist. Often regarded as the greatest painter of horses since Stubbs, his career was centered around this success as an equestrian painter. A passionate huntsman, Munnings developed a genre of painting, in the impressionist style, which revolved almost entirely around the Horse. He thrived as a society portrait painter, depicting his clients in the saddle or centred around the sports of hunting and racing. He also painted genre scenes, based on gypsy encampments and horsefairs, where once again the horse was the focal point. As a war artist, commissioned by the Canadian Cavalry Brigade to paint during WW1, his narrative, inevitably, involved the horse. 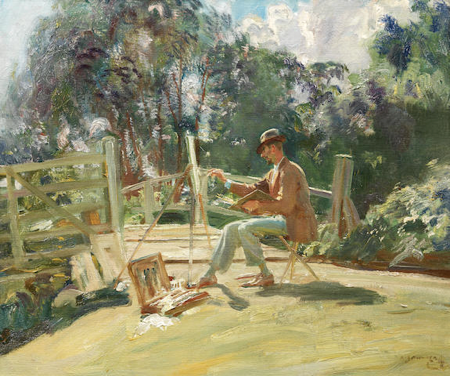 Munnings was brought up in Suffolk, in the heart of Constable country, but moved to Cornwall to join the Newlyn School. He was elected President of the Royal Academy in 1944. A good deal of his work is associated with the countryside around Exmoor, where he spent much of his life, but he returned to East Anglia, and the Munnings Museum is located in his final home, at Dedham in Essex. Very much an Impressionist painter, Munnings was a part of the Newlyn school of painting, which thrived in Cornwall at the turn of the 20th century. He famously railed against the forces of modernism and abstraction, especially Picasso, and perhaps as a result of this, he is more closely associated with traditional Sporting art than anything else. However, much of his skill is in his mastery of sunlight and shadow, and his loose and easy brushwork has its own elements of modernity. He painted a large number of highly accomplished landscape sketches, as well as a famous series of women in a canoe. Looking at these works it becomes easier to associate him with John Singer Sargent and William Nicholson, than the staid painting of the British sporting tradition. However, his reputation for landscape painting and portraiture has always been overshadowed by his fame as a painter of horses. The market for Munnings defies easy categorization. At auction Munnings has featured in sales of Sporting Art, Victorian Art, and British Impressionism, but never Modern British Art. Traditionally, his market has been buoyed by horse lovers, and his paintings of the races and hunting scenes have commanded the greatest prices. It is worth noting that inspite of the general decline in the Sporting Art market, Munnings market has remained relatively robust. However, perhaps reflecting the wider trend against sporting art, there has been a marked increase in the market for Munnings’ non-equestrian paintings, and in particular his landscapes. Already evident amongst the trade, this change in taste gathered more public momentum in March, when an Exmoor landscape “Withypool looking towards Winsford Hill” smashed its £15-25,000 estimate at Christies South Kensington to sell for nearly £160,000 including premium. Whilst the sporting paintings are still sought after with enduring enthusiasm, it is fair to say that the market since March has been dominated by his non-equestrian subjects. Perhaps Munnings the Impressionist is finally emerging from the shadow of this most acclaimed of Sporting Artists. The Munnings Art Museum is open Wednesday to Sunday from 2-pm-5pm, until October 31stand is located in the Artist’s former home at Castle Hill, Dedham, Essex.